To ensure that our future generation knows how to protect the world we live in and keep it green, it’s good to set an example for kids, whether they are our children, grandchildren, friends’ children, students, etc. Donating a car can be an excellent way to teach kids about recycling as well as the benefits of donating to charity. When you donate a vehicle to Wheels For Wishes, you get the best of both worlds, because you are not only recycling a vehicle and allowing it to be reused, but you are also making a donation that will benefit Make-A-Wish and help to grant the wishes of local kids. Vehicle donation can be a family decision so your kids know that vehicles can not only be recycled, but that they can also help to grant a wish for a local child with a critical illness. However, when your children start to question the actual recycling process and they begin to ask for more information, you can let a book do the explaining. We have put together a list of seven books that help to teach kids about going green and recycling. Leave a message on our Facebook and Twitter pages to let us know if you have read these books, or if you would recommend any others! If you grew up reading the Berenstain Bears series, you probably still remember a thing or two that the books taught you. Thankfully, Jan and Mike Berenstain are still at it and they are teaching kids every lesson they need to know. This time, The Berenstain Bears are going green! For the past twenty years, author Sheila Greenwald has shared Rosy Cole’s stories with the world, and now the subject of going green is being brought up from a teenager’s point of view. Watch Out World–Rosy Cole Is Going Green follows a middle school student in learning how to go green during a school project. She even learns how to compost worms! Whether you’ve read the book or you’ve seen the movie, you have surely heard of The Lorax by Dr. Seuss. The book concentrates on the importance of trees and why we shouldn’t cut them down. If you or your children are fans of Dr. Seuss, this will be the perfect book for you! Plus, who doesn’t enjoy a book with fun rhymes and creativity? Where Does The Garbage Go? by Paul Showers and Illustrator Randy Chewning talks about garbage and what happens to it. It also covers the topics of reusing and recycling so kids can learn how to produce less waste in the first place. For kids who will want to dive right in and do their part in the green movement, this will be the perfect book for them. Ellie O’Ryan makes going green fun with a book filled with coloring pages, tips on saving the Earth, fun facts, and also activities for kids to take part in to make the world greener. Plus, the book is printed on 100% recycled paper, which kids will love. Perfect for children as young as toddlers, this book features real kids taking part in the green movement and interacting with nature. Authors Dawn Sirett, Rachael Parfitt, Howard Shooter, and Dave King put together ideas for young children to learn how to preserve water, make a compost pile, respect the environment, and to love animals. Hey, That’s Not Trash! But Which Bin Does It Go In? To teach kids which items are to be thrown away and which are to be recycled, Renee Jablow and Illustrator Mike Byrne teach a hands-on approach for children learning the differences between recyclables and trash, even for the youngest readers. The book encourages the practice of sorting recyclables and learning what goes where. The book cover features three compartments so kids can start practicing right away! Maybe you will choose to read these books with your kids when you teach them about recycling for the first time. 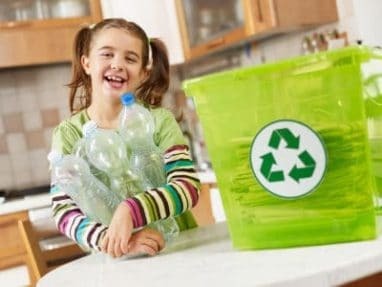 Once a child learns about the importance of recycling, there’s a good chance that they will want to dive right in and do their part. These books will help your children learn what they can do to make the world a little greener, no matter how young or small they are. If you choose the hands on approach of donating a vehicle together as a family, donate your car to Wheels For Wishes and help Make-A-Wish grant wishes for local kids at the same time. Just give us a call at 1-877-431-9474 or fill out our easy vehicle donation form. Both ways are simple and only take a few moments of your time. We look forward to hearing from you! You can help make the world a little cleaner while helping to grant wishes for kids in your community at the same time!